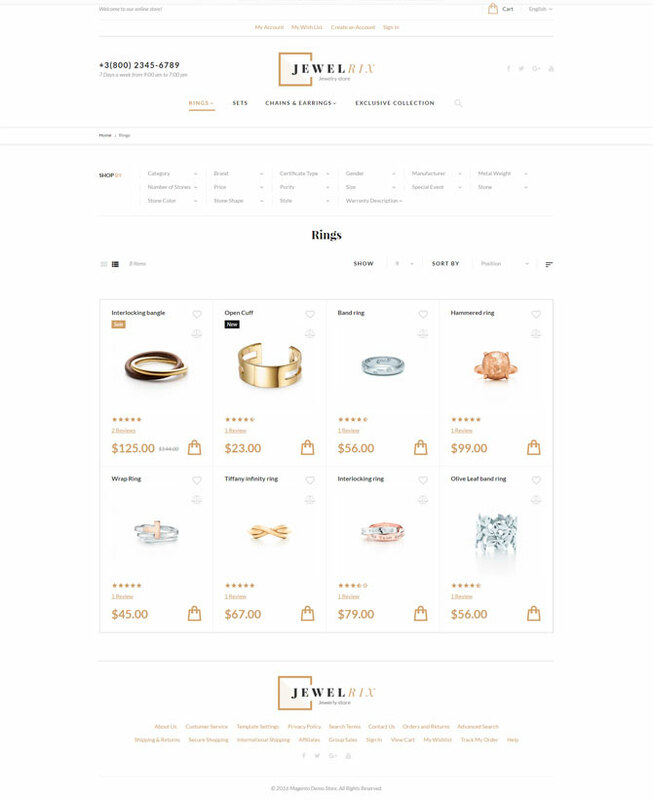 Jewelrix is one of the new Magento 2 templates created by professional TemplateMonster’s team and we are going to tell you more about it right now. The theme perfectly fits for jewelry, bijouterie, watches, accessories, and related business niches. As you see, the template has a very attractive layout, but it’s not only stylish and classy, but equipped with advanced functionality. Would you like to view the template’s demo? Liked what you have just seen and ready to download the theme? TemplateMonster’s developers were extremely inventive and passionate about Jewelrix design. In fact, they provide you with a ready-made out of the box solution for your jewelry store. 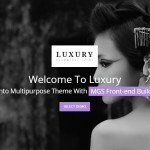 The theme has a clean, laconic layout that looks impressive and trendy. Neat icons, eye-catching page-width images, spacious pages, and outstanding visuals – Jewelrix offers these all. This set of features will ensure top-notch performance of your site. It’s not surprising nowadays that the theme is responsive and cross-browser compatible. It will run flawlessly across all major web browsers and last-generation devices. Wise usage of whitespace makes the theme’s pages easy to scan. Content is arranged in a grid-based manner, which enhances browsing experience. Home page of the theme is really user-friendly. Each and every detail there serves a specific goal. Decorative elements don’t distract user’s attention from the essential content. Theme’s header includes quick links to sign in form, customer’s account, wishlist and compare options. Social sharing icons can be found right next to the logo, allowing your customers access your corporate social media profiles with a single click. Ajax-based live search bar stands in the same row with MegaMenu. 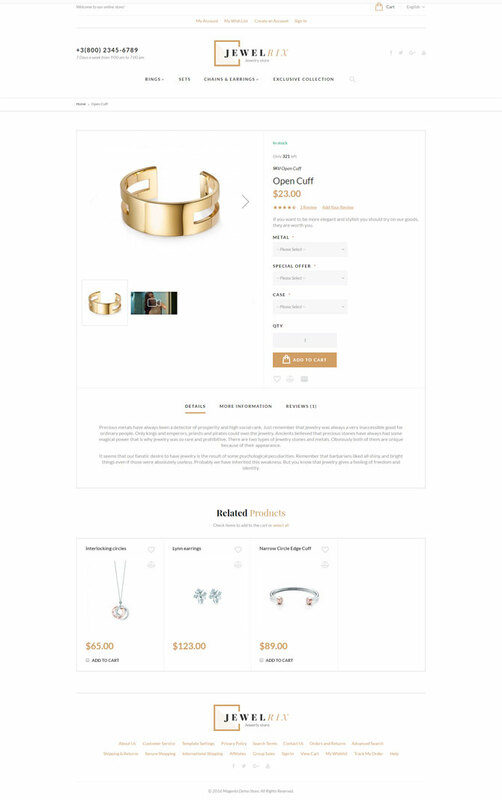 This way Jewelrix improve the default experience: people can either look for the desired items via the direct links available at the navigation panel or search for the products they wish by entering a keyword. As you type in a search bar, you are introduced to a list of the related products straight away. The search results become more accurate with every next letter. There is a huge header slider on the page. The element is intended to hook users’ attention to your special offers, new arrivals or hot deals. By the way, you can edit the slider as you like. The theme is equipped with a card-based list of category banners that enhances overall website navigation providing the users with quick access to the major collections of items offered on your web page. Scrolling down the page you see a carousel slider that contains new products. The products there are supplied with pricing details, add to cart functionality, and items names. What’s more, they have ‘add to cart’ and ‘add to compare’ options. Star ratings and customers reviews are also available, which help the customers with decision-making. Newsletter popup form of the theme is supplemented by a newsletter subscription field placed above the footer. Theme’s footer is serviceable and informative. It leads the users to the rest of your site’s pages, programs, social media profiles, and other important content. Without any exaggeration, the catalog pages usability is impressive. Their design is completely focused on the efficient presentation of the categories of available in stock items. Advanced filter options let the customers narrow down the list of items displayed on the page based on their brand, style, manufacturer, price, the number of stones, etc. They can also choose between grid- and list-based views as this option is provided for clients’ convenience. What’s more, people can decide what number of items they want to be displayed on the page, and sort products by name/price/new label/sale label. A product images gallery engages online shoppers into deeper investigation of the chosen product. They can view not only quality images, but also the embedded videos. That means that the users can see your products in action. Together with the detailed product specs, people can add the product to wishlist and compare it to other items on site clicking the respective buttons. Customer reviews are provided as well. A compilation of the related products is arranged above the footer, inviting the users to continue their online session. Jewelrix, like other TemplateMonster’s themes running on Magento 2 framework, is pre-loaded with a set of custom TM modules. That’s cool as you save $265 on the extensive functionality of your eCommerce site. All modules are shipped with the theme’s pack and can be used for free. Here is a list of the included modules. TM Ajax Wishlist. Logged in users only can leverage this module. It provides the ability to add an unlimited number of items to the wishlist for further reference, without reloading the page. TM Ajax Catalog Filter (for category pages including grid and list-based views). It lets the customers manage the number of items that are displayed on the page, apply dynamic sorting options without the page reloads and more. TM Ajax Compare. Enhance the users’ shopping experience by letting people pick out several items and add them to the comparison list, without waiting for the page to reload. TM MegaMenu. Sticky element for the theme’s header that provides online shoppers with quick and simple access to the entire inventory. The look and feel of your site’s main navigation panel can be adjusted according to your corporate style. Static blocks, drop-down menus, columns and rows, links, images, and banners – all these can be customized via a usable admin panel. TM Newsletter Popup. Actually, this is the first thing your visitors will come across when entering your website. As an administrator, you can manage the design, text, and timeout of the newsletter popup via the theme’s dashboard. The functionality can be enabled/disabled any time. TM Film Slider. A fully configurable module that offers an extensive selection of customization options and makes it easier to add a personal touch to the home page slider. Feel free to edit it with multiple layers, texts, buttons, and other elements. In addition to all the above mentioned features, the theme is well-documented. It is delivered with all layered PSD files that you might need for tweaking its design. The theme supports multiple languages, so you will be able to present its items to people from different countries. We are sure that your international clients will make the right shopping decision easily. 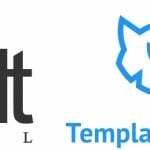 Traditionally, TemplateMonster provides free 24/7/365 support on its premium templates. You can always rely on the skillful help team professionals. 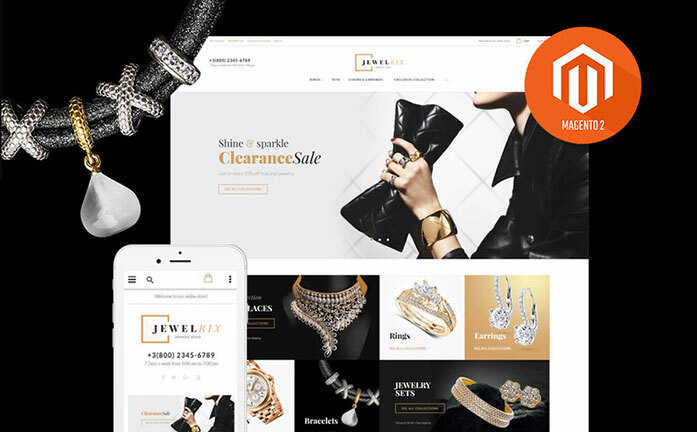 Summing it up, we would like to say that Jewelrix Magento Theme is a super-powerful solution to get your online business started in a few days. Its advanced customization options give you an opportunity to burst into the world of eCommerce with the resource that will have a perfect look and feel in the short run. Frankly speaking, the most time-consuming process will be uploading the site with your own content. However, the game is worth the candles. You will be happy with the result when you’re done with that. Don’t have time/skills/desire to bring your project to life? That’s OK, leave this work to professionals. Herein under you can watch the video about TM Service Center. Its team can deliver you a ready to use website. 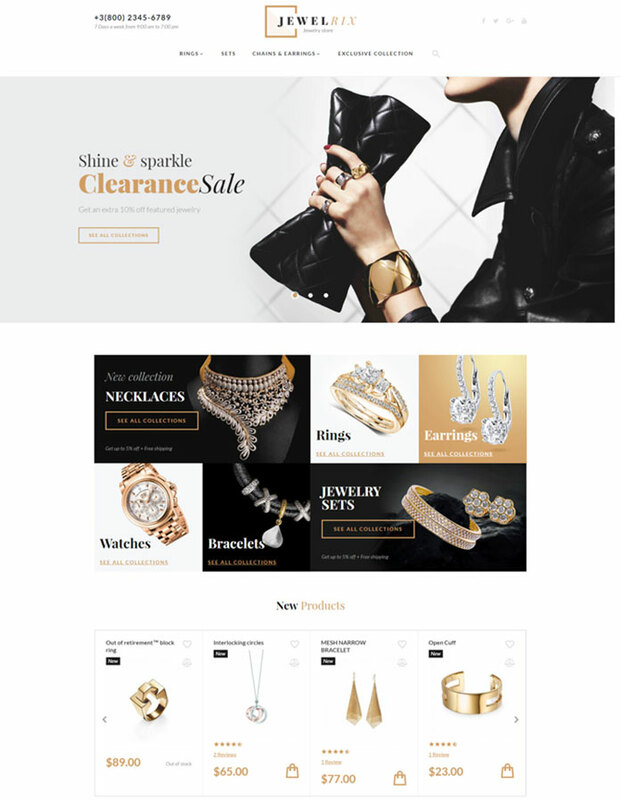 We would like to hear your opinion about the Jewelrix Magento 2 theme. What do you like/dislike the most about it? 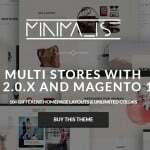 What do you think about the possibility of using custom TM Magento modules for free? Do you like the unique layouts of the catalog and product pages? Please share your comments at the section below.